Heat oven to 375°F. Spray large cookie sheet with cooking spray. 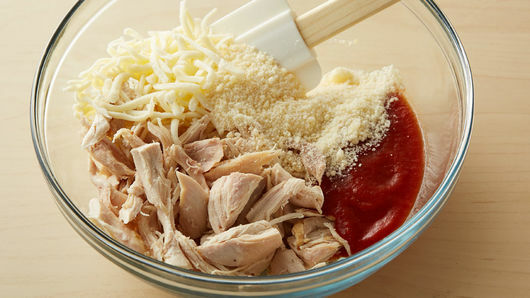 In medium bowl, mix mozzarella cheese, chicken, 1/2 cup of the pasta sauce and 1/4 cup of the Parmesan cheese; mix well. If using dough sheet, unroll dough, and place on cookie sheet to form 13x7-inch rectangle. If using crescent rolls, unroll dough and place on cookie sheet, pressing to form 13x7-inch rectangle and firmly pressing perforations to seal. 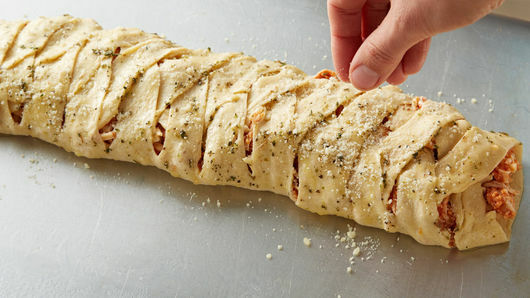 Spread chicken mixture in 3 1/2-inch-wide strip lengthwise down center of dough all the way to ends. Make cuts 1 inch apart on each side of rectangle just to edge of filling. 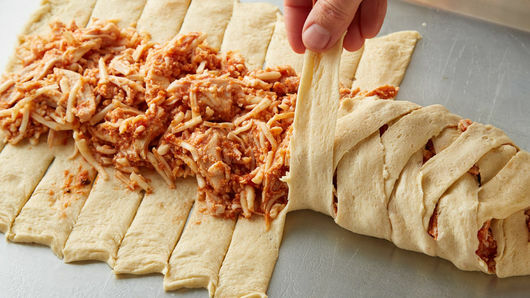 Alternating from side to side, fold cut strips of dough at an angle halfway across filling, slightly overlapping ends. In small microwavable bowl, microwave butter uncovered on High 20 to 30 seconds or until melted. 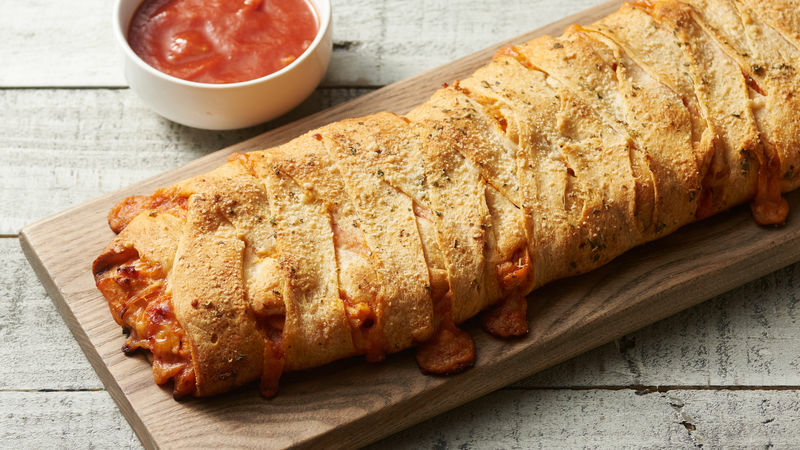 Stir in Italian seasoning and garlic powder; brush mixture on top of braided crescent dough. Sprinkle with remaining 1 tablespoon Parmesan cheese. Bake 20 to 25 minutes or until deep golden brown. Let stand 5 minutes before serving. In small, microwavable bowl, heat remaining 1 cup pasta sauce covered on High 30 to 60 seconds or until warmed through. Serve with crescent braid. This is best served warm. Deli rotisserie chicken is a quick and easy shortcut. Remove chicken from bones, and chop into bite-size pieces.